It’s probably no surprise for many of you to learnÃ‚Â that I love shooting photos. From time to time Catavino has shown pictures I have shot, and ever since Gabriella came to work full time for Catavino, we have a protocol when visiting vineyards that leads to many more exposures than before. Gabriella is a great writer and listener, and with her big blue eyes, her job is to charm the wine maker and get the story, as I wander about shooting pics and snagging shots of this and that. It works well and I love doing it. I suppose I had no choice but to like photography. As a child, my dad probably looked more like a lens to me than a face, as he was constantly taking shots. I would follow him around with a block of wood shaped like a camera that my Grandpa made me, shooting at everything and anything my dad took a picture of. My other Grandpa, and all my uncles, are still perpetual photo bugs. One of my uncles is even a professional photographer in Belize! So while I still have a lot to learn, and a long ways to go, I love doing it, and I love the ability to use tools like Flickr to share my photos and Lightroom to develop my RAW photos. And for all you bloggers out there, I believe in the Internets; therefore, all of my pictures on Flickr are licensed with a Attribution-NonCommercial-ShareAlike Creative Commons license. What does that mean for you? It means I encourage you to use my photos on your blog, as long as it’s non-commercial and you give me credit. Also I would REALLY appreciate it if you tell me when you do use a photo, just so that I can say thanks, and see how you are using them. That said, if there is a commercial site out there who wants to do something with my pics, I’m all ears! Just drop me a line. Today, there is a new tool that I hope some of you will check it out. It’s called Imagekind. This summer, my Dad turned 60, and since he has been one of the major reasons that we are stillÃ‚Â pursuing our dream of living in Spain, working in the wine world, we thought it would be appropriate to give him a picture of some vines for his wall. Unsure how the quality would be, we tried out Imagekinds printing service, using some of their high end paper. The results were incredible! This past month, while I was in La Rioja, the vines were just starting to turn colors. EWBC sponsor, Dinastia Vivanco, we’re harvesting their first grapes and I didn’t want to miss the opportunity of seeing my first vintage in La Rioja. After a quick peak at the harvest inside the winery, I contented myself to wander through the stony vineyards and shoot photos of multicolored Tempranillo vines, while occasionally testing grapes for proper sugar levels. Yum! 🙂 What I took away from my shooting adventures was one of my first photos that I am truly proud to offer up for sale. 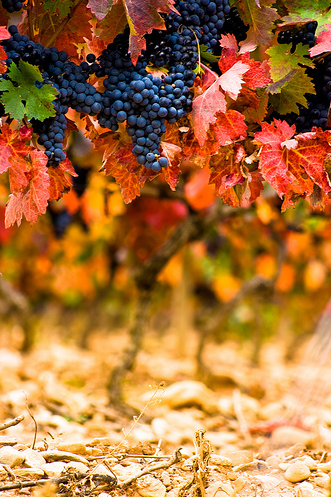 This picture is of vines in a rainbow of colors, simply calling for someone to come and harvest them. Through Imagekind, you can order this image in a variety of paper stocks and sizes. Take a look at this pic with a black background in a larger size. I’ve recently taken and added some other photos to my Imagekind account that are also available for print. The pricing is quite good, so if I sell even one photo, I will put the sale towards upgrading my account to allow for more pictures, and to maybe, separate galleries so that photos from different regions are in there own place. My gallery can be found here: http://ryanopaz.imagekind.com/. Also, as with any website today, there is an element of community involved. So if your a budding wine photographer, feel free to add your photos to the new wine group I just started. So let me know what you think, and everyone have a happy Halloween! No wine of the week today, but we may have a special Sunday edition, since we will have some friends coming over Saturday night for a tasting. PS: Special OFFER! If anyone does buy a print, send me an email and let me know. I’ll send you a signed card that can be fixed to the back of the print, with details of the photo. Just email me which print you bought and your mailing address!